A traditional dancer performs during the inauguration of the new African Union headquaters in Ethiopia's capital Addis Ababa, January 28, 2012. The African Union has inaugurated a new headquarters with tributes to China's rise in Africa, and to the political prisoners who died in the jail that once occupied the site. The new $200 million Chinese-built headquarters was officially opened by China's senior political adviser Jia Qinglin, standing in for Premier Hu Jintao. In a speech to an audience of heads of state and African diplomats in the spectacular 2500-seat Grand Hall, Jia hailed the rapid growth of China-Africa relations. China's trade with African countries reached $150 billion last year, he said, a 13 fold increase in the past decade. Others at the ceremony praised China as the model for Africa's economic growth. Ethiopian Prime Minister Meles Zenawi derided western economic prescriptions of the late 20th century as “medicine that turned out to be worse than the disease." He singled out The Economist magazine for criticism, saying policies it advocated a decade ago had set the continent on the path to recolonization. "The Economist, which espouses the very market fundamentalist ideas that wrecked our economies, had a banner headline in one of its issues which simply read, 'The Hopeless Continent.' 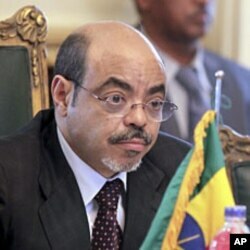 Clearly, these pundits, these experts and international magazines had given up on Africa," Meles said. The Ethiopian leader suggested that the recent rapid growth experienced by many African countries had coincided with the trend toward adoption of China's state-led economic model. He said western economists were having to reconsider their ideas in light of what he called “the African Renaissance." "The pundits and academics who were publicly advocating for the recolonization of our continent have now refrained from doing so, at least in polite company," said Meles. "The very magazine that came up with the banner headline, 'The Hopeless Continent' a decade ago, has recently come up with a new banner headline that simply read, 'Africa Rising.' Africa is rising indeed. The African Renaissance has begun." The ceremonies included dedication of a memorial to victims of the Red Terror campaign during the previous Ethiopian government led by Marxist dictator Mengistu Hailemariam. Prime Minister Meles noted that the new AU headquarters had been built over the site of the maximum security prison where opponents of the Mengistu regime were tortured and executed. "People in Ethiopia used to call that infamous prison Alem Bekagn. Loosely translated it means, 'I have given up on this life.' This building, which will now house the headquarters of our continental organization, is built on the ruins of a prison that represented desperation and hopelessness." African heads of state will convene Sunday for a two-day meeting in the new conference hall. The summit theme, "Boosting Intra-African Trade," is being overshadowed by several hotly contested elections for leadership posts. AU Commission chairman Jean Ping's bid for a second term is being challenged by South Africa's veteran freedom fighter and former foreign minister Nkosazana Dlamini-Zuma. The election, by a secret ballot of African heads of state, is set for Monday.